Dean Matt Barber, J.D., Esq. William J. Federer is a best-selling author, widely acclaimed speaker, and former U.S. Congressional Candidate. Bill has appeared on: CSPAN, FOX, Hannity & Colmes, O’Reilly Factor, NPR, MSNBC, ABC-Time Warner Affiliates, CBN, TBN, INSP, TCT, FamilyNet, FamilyLand TV, Coral Ridge Hour, 700 Club, AT&T Cable, Charter Cable, Danny Fontana Show, iLife TV, FOX Strategy Room with Brian Kilmeade, hosted CSPAN’s George Washington Book Festival-February 26, 2000, CTN with Herman & Sharron Bailey, Grizzly Adams Television Production documentaries, and numerous local programs as well as thousands of radio interviews. President, American Alliance of Jews and Christians. Widely featured on TV programs including “The O’Reilly Factor, Hannity and Colmes, Faith Under Fire, and Politically Incorrect. Columnist for Townhall.com and several other sites. “Homeschooling two daughters for many years, bolstered the inescapable conviction that the future of America depends on the values Christian parents instill in their children. This simple, but vitally important truth has been a casualty of America’s rapid decline. The cultural deception is so pervasive that America is perilously close to going the way of every great civilization before us. “I admire Dr. Lloyd Stebbins. The reason is he carries a burden for the work of the Kingdom. He has authored a very good book and spoken to very important topics for the Christian trying to navigate the troubles waters of our culture. “Dr. Lloyd Stebbins, with the unapologetic fury of a saint, dares to tell the truth about the overwhelming forces in our society that are moving us further and further away from God’s truth. 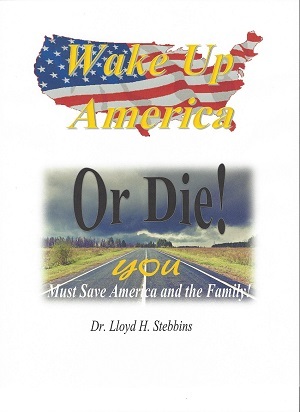 Wake Up America or Die is a sobering wake-up call for all who cherish traditional values. This book also offers real hope because when our problems come sharply into focus, so do the solutions. “Like the Prophet Jeremiah, warning of impending doom, and lamenting over the consequences, Dr. Lloyd H. Stebbins hits the proverbial nail on the head in his book. He approaches the real heart of the matter, clearly delineating the problems with society and the issues facing America today. What society can maintain a viable existence when faced with dysfunctional families, lack of morality, a humanistic and indoctrinating education system, and an overstepping government? “LIFE, LIBERTY, AND THE PURSUIT OF HAPPINESS is an outstanding resource for enhancing your home school program. The content spans the broad spectra of ages and curriculum: science, music, art, history, religion, social studies, and literature. Discover and develop your children’s strengths, gifts and passions by aligning their views with God’s expansive, holistic world view. Dr. Stebbins demonstrates that everyone is a role model. Within just four generations each of your children’s lifelong pattern of foolish or wise choices will ultimately influence nearly 2 million people for evil or good. Dr. Stebbins’ book is a powerful tool for launching a rich pattern of God-honoring decisions. “My friend methodically unmasks the unintended consequences of America’s decades-old pursuit of secularism. Misguided leaders in politics, media, education, and entertainment have virtually removed any concept of the transcendental or the spiritual from many homes, the public classroom, industry, and society at large. American life today is largely face-value, focused on self. There is no awe. There is no biblical aspiration to protect the inalienable rights which have been given to all people by our Creator, rights our government was purposefully designed to protect. Runaway secularism poses the single greatest threat to individual fulfillment, national prosperity, and America’s role as a world leader. Karen Steverson MBA, JD, Esq. Congratulations on the new book! Extremely relevant and important subject matter in a critical time for the American family. I’ll look forward to seeing the entire text. Thank you, Randy. The entire text is about 415 pages. It takes about a year to engage a publisher and jump through all the publisher’s hoops before printing. I personally believe that the book’s message is extremely urgent. Keep watching the blog. There will be new blog messages about 2-3 times each week. Many of them will be excerpts from the book. Your mode of explaining everything in this piece oof writing is in fact nice, every one be able to easily know it, Thanks a lot. And one of good solutions from a good scorer is to get a 10 in the middle of the bottom row, then make 7,8,9 around it. of which has a simple challenge to overcome. She holds a recognized degree in Communication and Information Systems. Interesting, Andres. But I have no idea what you are discussing. Dr. Stebbins, I am eager to have the opportunity to read your book. You are so full of knowledge and wisdom. From what I can see already, this book will be one for the ages. Good luck on publishing and God Bless you and all that you do. I will be following your blog closely. Thank you for your very kind thoughts and encouragement. Thank you, Russell, for your kind thoughts and enthusiastic encouragement. It means a lot to me.